Below is a summary of our joint report. Click to see a chart showing the Overall Ranking. Our elections are so complex, with so many different jurisdictions and varying technologies, that problems are inevitable. And, as the technology used for elections has become more complicated, the opportunity for error has substantially increased. This report reviews how prepared each state is to ensure that every eligible voter can vote, and that every vote is counted as cast. Because we cannot predict where machines will fail during the upcoming national election, every state should be as prepared as possible for system failures. The Verified Voting Foundation, the Rutgers Law School Constitutional Litigation Clinic and Common Cause surveyed states’ voting equipment and ranked the states according to their preparedness. The rankings are based on how states compare to a set of best practices already being used in some places. Does the state require paper ballots or records for every vote cast? When computer failures or human errors cause machines to miscount, election officials can use the original ballots to determine correct totals. Additionally, paper ballots or records can be used to audit machine counts to determine if outcomes are correct. Does the state have adequate contingency plans at each polling place in the event of machine failure? Machine repair should occur quickly and emergency paper ballots should be made available if any machine fails and to alleviate long lines. Does the state protect military and overseas voters by ensuring that marked ballots are not cast online? Voting system experts at the National Institute of Standards and Technology and cyber security experts at the Department of Homeland Security warn that even state-of-the-art online voting technology lacks adequate security and privacy protections. Ballots cast over the Internet can be subject to alteration and voters may lose the right to a secret ballot. Has the state instituted a post-election audit that can determine whether the electronically reported outcomes are correct? Simply voting on paper ballot systems does not increase the accuracy and integrity of election results; the ballots or records must be used to independently audit the vote count. Mandatory comparison of a random sample of the paper ballots to electronic totals is one of the best ways to ensure that the reported outcomes are correct. A well designed audit should use statistical sampling methods tied to the margin of victory and should be able to correct the outcome if it is wrong. Does the state use robust ballot reconciliation and tabulation practices? These basic procedures, including reconciling the number of votes cast to the number of voters who signed in and reconciling precinct totals with county-level totals, help ensure that no ballots are lost or added as the votes are tallied and aggregated from the local up to the state level. Similar vote-counting errors may go undetected during the 2012 elections unless the mistake is so large and obvious – like the software malfunction in South Dakota – that it can’t be ignored, or the state has adopted procedures – like the post-election audit done in Florida – as recommended in this report. The report assessed each state based on how its laws and procedures matched up to best practices in the categories identified above. These metrics were developed in consultation with leading election officials and security experts — in each of these areas. We rated each state on a five-tier scale, from inadequate through excellent. We determined that five states – Minnesota, New Hampshire, Ohio, Vermont and Wisconsin – are the best prepared to catch voting system problems and to protect voters from disenfranchisement due to equipment failures. On the other hand, Colorado, Delaware, Kansas, Louisiana, Mississippi and South Carolina are the least-prepared states. The rest of the states were missing one, two or three key procedures or systems that would adequately protect voters. Sixteen states use paperless machines in some or all counties, prompting an “inadequate” grade. In other words, these machines produce no independent record of the vote cast, which is necessary for recounts or audits. These states are: Arkansas, Colorado, Delaware, Georgia, Indiana, Kansas, Kentucky, Louisiana, Maryland, Mississippi, New Jersey, Pennsylvania, South Carolina, Tennessee, Texas and Virginia. The other 35 states use voting systems which either require the use of a paper ballot or produce a paper record. On contingency preparation for possible equipment failures, three states – California,Indiana and Ohio – ranked “excellent” because they required most or all of the best practices requiring machine repair and replacement and provision of emergency ballots. None were ranked “inadequate” and seven states – Colorado, Delaware, Louisiana, Mississippi, Nevada, Utah and West Virginia – were ranked “needs improvement.” The rest of the 41 states ranked “good” or “generally good,” or were not ranked because paper ballots are the standard polling place system. Twenty-two states have paper-based voting systems and conduct audits. 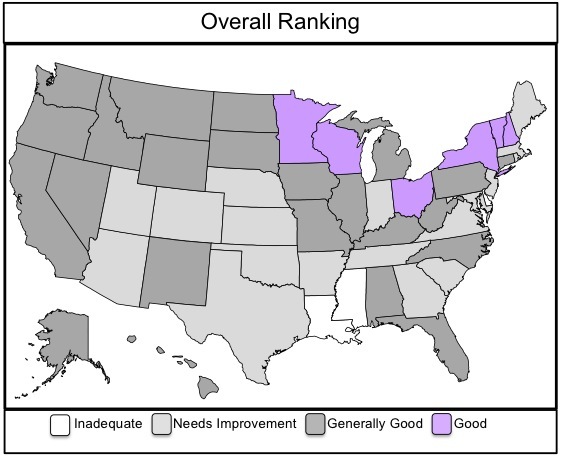 These states received a “good,” a “needs improvement,” and in one case, an “excellent” ranking, depending on the quality of their audits: Alaska, Arizona, California, Connecticut, District of Columbia, Florida, Hawaii, Illinois, Minnesota, Missouri, Montana, Nevada, New Mexico (which received the “excellent” ranking), New York, North Carolina, Ohio, Oregon, Utah, Vermont, Washington, West Virginia and Wisconsin. Four states require audits but do not use paper-based voting systems statewide and so a portion of their ballots go unaudited. These states – Colorado, Kentucky, Pennsylvania and Texas – received a “needs improvement” rating. And 25 states conduct no audits at all and received an “inadequate” rating: Alabama, Arkansas, Delaware, Georgia, Idaho, Indiana, Iowa, Kansas, Louisiana, Maine, Maryland, Massachusetts, Michigan, Mississippi, Nebraska, New Hampshire, New Jersey, North Dakota, Oklahoma, Rhode Island, South Carolina, South Dakota, Tennessee, Virginia and Wyoming. Although it takes effort and resources to do so, our best practices have already been implemented in a number of states, with overwhelmingly positive results. We recommend that every state adopt the best practices in this report in order to safeguard our democracy. We hope that this report serves as a resource guide to election officials, policy makers and concerned citizens alike. Election officials can see and discuss what their peers across the nation are doing to make elections secure and reliable. Similarly, citizens can work with election officials to implement the best practices discussed in the report. Citizens can also use the report to identify and help solve problems that might arise on Election Day. [i] Our Vote Live Election Incidents, Voting Equipment Problems, 2010 General Election, available at http://electionawareness.appspot.com/reports?election=247001&subset=252001&state=--&followup=-1&sortBy=created&sortOrder=desc&county=--&user=-1 http://electionawareness.appspot.com/reports?election=247001&subset=2520... (last visited June 28, 2012). [ii] See, e.g., Cameron W. Barr, Md. Election Problems Fuel Push for Paper Records, WASHINGTON POST, Sept. 17, 2006, at A4; Michael Scherer, Electronic Voting Machine Problems in Myrtle Beach, TIME, SWAMPLAND BLOG, (Jan. 19, 2008), http://swampland.time.com/2008/01/19/electronic_voting_machine_prob/. [iii] See, e.g., Brian C. Mooney, Voting Errors Tallied Nationwide, BOSTON GLOBE, Dec. 1, 2004; Mary Pat Flaherty, Ohio Voting Machines Contained Programming Error That Dropped Votes, WASHINGTON POST, Aug. 23, 2008. See also Josh Sweigart, Ohio Officials Prepare for Voting-Machine Breakdowns, HAMILTON JOURNAL-NEWS, Aug. 28, 2008. [iv] See, e.g., John Archibald & Brett J. Blackenridge, Early Printout Was Only Source of Wrong Tally, BIRMINGHAM NEWS, Nov. 10, 2002; Nedra Linsey, McComish’s District 20 2nd-place Finish Confirmed, ARIZ. REPUBLIC, Sept. 24, 2004; Ben Cunningham, Malfunction Delays Hasting Results, GRAND RAPIDS PRESS, May 4, 2006. [v] See, e.g., More than 4,500 North Carolina Votes Lost Because of Mistake in Voting Machine Capacity, USA TODAY, Nov. 4, 2004; Tim O’Meilia, State Faults Elections Office for Lost Votes, PALM BEACH POST, July 2, 2008. [viii] Domenico Montanaro,, SC Voting Problems, FIRST READ, Jan. 19, 2008, http://firstread.msnbc.msn.com/archive/2008/01/19/592019.aspx.